The range and versatility of our branch membership has featured prominently in our meetings since the beginning of the new season and we have welcomed a further increase in membership over the period. 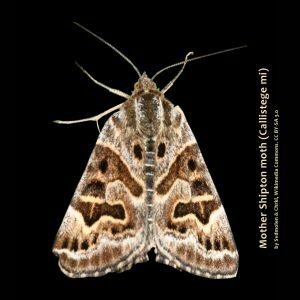 In September Tony John enthralled us with an intriguing talk on moths in a country garden, standing in at short notice for our scheduled speaker. Moths are often misunderstood yet hold a vital role in the wildlife ecosystem. Not only are they valuable pollinators of flowers but they are also an important food item being the main diet of bats and of many woodland birds. What is probably less well known is that many gardens will host 200–300 different species of moths and that in general there are three times as many species of moths as there are of butterflies. Stepping in in October, again at the very last minute, Dr Stuart Windsor, with an enlightening yet at sometimes rather gruesome account of a number of his ancestors who spent much of their lives in West of England institutions, such as the Exminster Asylum, gave us much food for thought. In general life was harsh, often brutal for those on public relief, many dying from diseases, prejudices and destitution. The topic proved to be particularly pertinent as more and more of the public are taking an interest in exploring their personal family history. Then, as recently as January, over 40 members and guests attended the Branch’s annual social evening and buffet supper in the presence of two more members, Councillor Paul Ward and his wife Jane, attending in their official capacity as Mayor and Mayoress of Tavistock. Finally yet another of our members, John Mather, introduced a short but light-hearted review of Trekking for Oldies in Nepal, recalling a fascinating expedition undertaken last year by him and his wife, Jenny Bennett and proving a fitting end to a memorable evening. 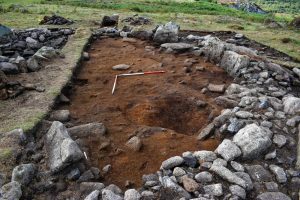 Round house at Holwell Tor under excavation in September 2018. Photo courtesy Dr Lee Bray. In November Dr Lee Bray, an archaeologist for Dartmoor National Park, with a presentation covering an enormous time span from a stone axe dating back to the Lower to Middle Palaeolithic period to the mining landscapes of the present day, gave us a splendid introduction to a subject which proved to be of great interest to a primarily local audience. Dartmoor is one of the most important archaeological areas of Western Europe with 5% of England’s ancient monuments to be found within its boundaries and the variety of material discovered is vast from prehistoric burial mounds and Iron Age hill forts to medieval longhouses and tin mining. The myths and realities behind the nature, use and some of the science underlying the well-known but frequently misunderstood or misrepresented history of the medieval longbow and of the archers who used it formed the unusual and intriguing subject for the December meeting given by Chris Thomas, a historical leatherworker by trade involved in the making and collection of reproduction artefacts. 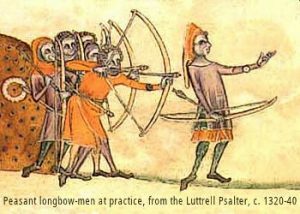 The English longbow was a murderously effective medieval instrument long used by the English in hunting and as a weapon in warfare. This was a weapon whose technology had been mastered to a high degree, each bow and arrow being tailored to perfection. Chris had brought with him many period style pieces of equipment which members were encouraged to inspect and handle during the refreshments following the end of another illuminating talk.